Enjoy this innovative slot machine with all the cheeky fruit symbols that will jump around and celebrate your wins. The Plenty on Twenty slot from Novomatic is simply a highly entertaining slot machine that will surely put a smile on your face on the greyest of days. The 7 is the wildcard that will substitute for all symbols except for the scatter – the Star. With 20 paylines over the 5 reels, a big toothed melon, a lemon wearing make-up and a cheeky orange you can be sure to laugh your way to your fortune. Graphics & Appearance: The Plenty on Twenty slot machine is an unusual reel spin experience. Instead of the normal spins where the symbols are fixed on the reels, Plenty on Twenty offers an amazing reel thrill where the symbols “come to life” and changes expressions and moves around. For example, as soon as the reels start to spin, the symbols start falling and make funny moves and faces. 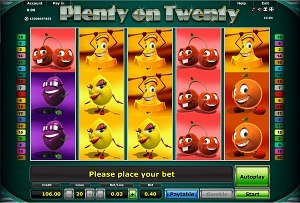 The Plenty on Twenty is obviously a very graphically advanced slot machine in comparison to most other, especially on the reels. When you hit a spin win, the symbols starts jumping around. It makes this slot very amusing to play and very entertaining to watch. Gamble Feature: The gamble feature on Plenty on Twenty is a 50/50 gamble where you predict the next card to be drawn. Will it be red or black? Upon a successful prediction, your winnings are doubled and you can choose to collect the winnings and return to the reels or to make another gamble. The gamble feature is accessible as soon as you hit a spin win. You will activate the feature by clicking on the Gamble button which is located next to the Start button in the lower right part of the game window. Game Symbols: The symbols are all modified versions of the classical slot symbols. The 7 is the highest paying symbol and it will substitute for all other except for the scatter symbol (the Star symbol). You will find funny versions of the melon, bell, lemon, oranges, plumb and cherry symbols. Instead of having the normal look, the symbols in Plenty on Twenty have smiling faces and arms that move around. Bonus Feature: There is no bonus feature in Plenty on Twenty. Betting Options: The Plenty on Twenty slot machine has 20 paylines over 5 reels. You can easily choose your preference by using the + and – buttons which are located in the lower part of the game window. The lowest bet is 0.02 per pay line which make up to 0.40 if you are using all 20 paylines. The stake amount can also be configured by using + and – buttons. Game Features: You may use the Autoplay function when playing the Plenty on Twenty slot. This is a comfortable way to enjoy the funny symbols/characters in this game. By clicking on the Autoplay button you will activate the function. You can also deactivate the Autoplay by clicking on the same button again. Please note that the gamble feature is not available for the lower spin wins when you are using the Autoplay function.